Attention teachers who are looking to have an American history class without a textbook! In “Note-Taking Guide for E Pluribus Unum,” students will investigate the political manoeuvres behind America’s drive for independence, particularly the Stamp Act Congress, the Sons and Daughters of Liberty, Committees of Correspondence, First Continental Congress, Second Continental Congress, Thomas Paine’s "Common Sense," and the Declaration of Independence, through an authoritative website, ushistory.org. 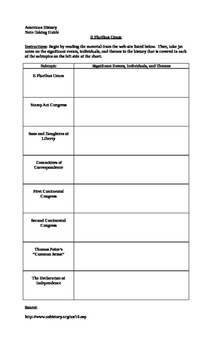 Students are required to take jot notes on the historically significant events, individuals, and issues that have contributed to the shaping of this period in American history. This study guide naturally includes the web address upon which it has been based. Overall, this note-taking exercise has served as an excellent companion for students at both the grade school and high school levels and has acted as a wonderful tool in the writing of quizzes, tests, essays, reports, and exams.